Just to change things up a bit here at Studenomics I have decided to discuss college student credit card debt reduction in greater detail. I will share some debt reduction tips over the next few weeks. Some of the tips will be short term. For the more advanced credit card users, some of the tips will be long term. Credit card debt reduction tip #1: Try the sleep-on-it rule. You may have heard of this in the 6000 different formats that personal finance bloggers have presented it in over the years. Everyone has a different name for it. I call it the sleep on it rule. I’m pretty sure it doesn’t require much explanation. Basically before you make a major purchase you NEED to stop yourself, put the item down, go home, go about your life the same way you normally would, go to sleep, wake up, and then decide whether you will go all the way back to the store to buy the item. Making a purchase with your credit card is simply too convenient. For my tips on reducing credit card debt I will NOT advise you to cut up your credit cards or to hide them in your sister’s room because that is an extremely short sighted decision. I also believe that everyone reading this blog is a rational human being that has the ability to practice a certain level of self control. Why is this an effective rule to reduce credit card debt? It creates a barrier. When you wake up the next morning (or afternoon) you need to find the motivation to go all the way back to the store and make the purchase. It builds a great habit. If you can successfully practice this rule then you will basically create a shopping system where you at least second guess major purchases. How can the sleep-on-it rule be implemented effectively? When you see a decent product at a decent price you may get excited and immediately swipe your credit card. If you can find the self-control to put that card away and put the product back on the shelf, then you need to sleep on it. Once you do it once you will be able to do it again. The hard part is putting that new iPhone or Dolce & Gabana cologne down the very first time to sleep on it. You also need to only use the sleep-on-it rule for fairly major purchases. No point to think twice about buying lunch or a bottle of water on your way home. For example, before I purchased my boxing gloves I went home to to sleep on it. When I woke up I still had them on my mind and I realized that this was a purchase I truly wanted to make. A friend of mine that plays the guitar in a band buys a new guitar every couple of months. A few months ago he was in a guitar store and saw that an expensive guitar was on sale (coincidentally it was still expensive). Instead of making the purchase right away he decided to go home to think it through. A few months went by and he never even thought of this guitar again until we talked about the sleep-on-it rule. Have you ever tried the sleep-on-it rule? If not, what rules have you used to reduce your credit card debt? 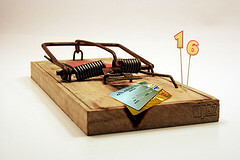 College student credit card debt can follow you well into your 30s if you don’t deal with now!